NAIROBI, Kenya — Political infighting has long hampered Somalia’s Transitional Federal Government, or TFG, with rifts between leaders often playing out in awkwardly public ways. But a meeting of members of Parliament geared toward naming a committee to choose a new speaker yesterday disintegrated into an all-out brawl of punching and kicking. “I saw a bleeding MP, while another’s hand was broken,” said journalist Ali Bashi Abdulahi to the Somalia Report, where a video of the scuffle was originally posted. “All the MPs supporting the ousted speaker were chased out,” Abdulahi said. The controversy that sparked the fistfights began last week when members of Parliament gathered at a session unauthorized by then Speaker Sharif Hassan Sheikh Aden and voted to impeach him. Frustration over Sharif Hassan’s tenure as speaker arose after he failed to convene the Parliament for two months. Sharif Hassan, who has had a stormy relationship with President Sheikh Sharif Ahmed, was in Italy at the time. The TFG’s credibility is “quite difficult” at the moment, said Wafula Wamunyini, the African Union peacekeeping mission’s deputy representative at a briefing attended by Enough in Mogadishu. “I cannot foresee in the near future having a fully functional government in place. I don’t foresee it,” he said, adding that one of the biggest political challenges is the frequent change in leadership. The current political row comes at a time when famine and severe food insecurity persist in large swaths of the country, including among displaced populations in Mogadishu, notably where the TFG has the most influence. A recent U.N. overview of the humanitarian situation indicated that 250,000 people are still at risk of starvation, nearly five months after famine was declared. 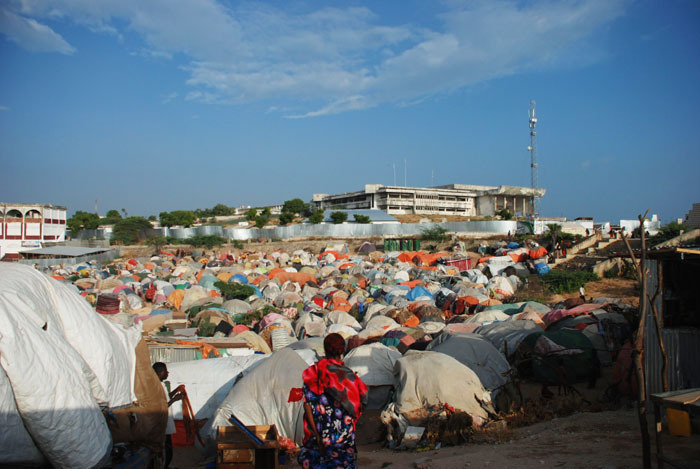 Enough conducted interviews with people in several camps for displaced in Mogadishu who reported that they have not received assistance beyond a daily ration of one meal a day. Some indicated that they often miss their one meal a day because TFG-aligned militias divert the food from the camps to their own communities. Further complicating relief efforts and security, expanded military operations targeting the militant group al-Shabaab now involve troops from Kenya and Ethiopia, in addition to the AMISOM peacekeepers concentrated in Mogadishu. AMISOM and the TFG have pushed al-Shabaab to the outskirts of the capital, reducing the firefights that regularly plagued the city. But with Shabaab coming under pressure from three sides, the group has altered its tactics, asserting its influence by staging regular attacks with car bombs, IEDs, and suicide bombers. Further, Shabaab’s strategy of embedding itself in civilian communities to deter attacks continues to lead to tragic results. Air strikes presumed to be carried out by Kenyan military planes in Shabaab-held southern Somalia on Tuesday reportedly killed at least 10 people and wounded many others, the majority allegedly civilians. A resumption of political infighting is unacceptable and is not in the interest of the Somali people, who continue to suffer from 20 years of conflict and one of the worst famines for a generation. As the UN Security Council set out in May, the TFIs [Transitional Federal Institutions] cannot assume that the support of the international community will continue indefinitely and we reiterate the international community’s willingness to consider sanctions against spoilers of the peace process. After agreeing to the Kampala Accord, which last June extended the mandate of the TFG for an additional year, parties came together at a U.N.-sponsored meeting in September to set benchmarks to prepare the country for elections to mark the end of the transition. The roadmap prioritizes four tasks that must be completed by next August, including security, a constitution, reconciliation, and good governance. A high-level meeting to begin work on the constitution opened yesterday after delays, the last prompted by the controversy over the sacking of the speaker.